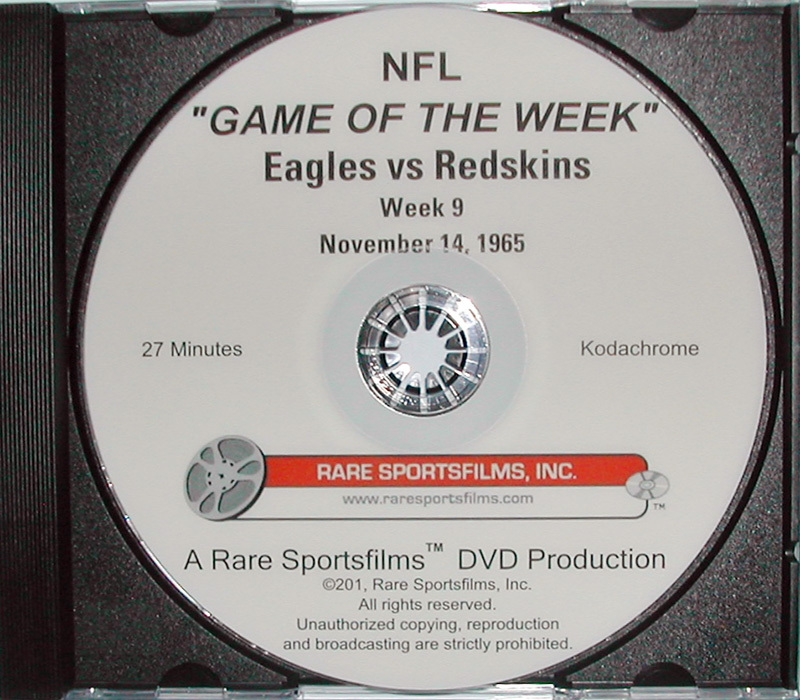 The November 14, 1965 Eagles-Redskins NFL "Game-Of-The-Week" film is another nostalgic title from the vast Rare Sportsfilms library of old pro football films not available from any other source - not even NFL Films has this one! Narrated by Tom Brookshier, this 27-minute film, now available on DVD, is in gorgeous COLOR! The Eagles are 2-6 and have lost four games in a row entering this game at Franklin Field, Philadelphia. The Redskins are 3-5 and have won their last three games after starting the season 0-5. Both starting quarterbacks are healthy and ready to go, Norm Snead of the Eagles and future Hall-Of-Famer Sonny Jurgensen of the Redskins. The first big break of the game comes early, when a short Pat Richter punt is fumbled ahead by Irv Cross and picked up by LB Mike Morgan who is stopped at the 'Skins 34-yd line. A 33-yd pass from Snead to Pete Retzlaff puts the ball on the Washington one-yard line, from where Snead sneaks over on the next play and the Eagles lead, 7-0 at the end of the first quarter. In the second quarter from the Redskin's 38-yard line Jurgensen throws a pass to Preston Carpenter, who takes it all the way down to the Eagle 20. Carpenter, however breaks his arm on the play and must leave the game. From there a 21-yd pass to Bobby Mitchell brings the ball to the 5, where Dan Lewis soon scores on a pass from Jurgensen to tie the score at 7-7. In the third quarter the Redskins have a third and 16 on the Eagle 25 when Jurgensen is chased out of the pocket but gets off a pass to Pat Richter on the 6 and Pat takes it in to give the Redskins a lead for the first time. Later from his own 26-yd line, Snead leads the Eagles on a drive up field. Catches by Retzlaff, Glenn Glass and a 26-yd snag by Ray Poage have the ball on the Redskin’s six. On second and four, Snead tosses out to Timmy Brown, who scores, capping the 74-yd, 9 play drive and again tying the score at 14-14. Fourth quarter action has the Eagles starting on their 15-yd line where Snead heaves a 78-yd pass to Pete Retzlaff who is downed 7 yards short of a TD! Tim Brown next runs the ball to the 1-foot line. The Redskins put up a goal line stand, but on 4th and goal from the one, Earl Gros bowls over and the Eagles are now in front, 21-14 after going 85 yards on five plays, including the last three at the goal line. There are now only two minutes left for "Jurgy" to try to pass the Redskins up field starting at their own 17-yd line! With the Eagles blitzing on almost every play, Jurgensen passes the 'Skins to the Eagle 40. On third and 13, he is chased out of the pocket and throws a soft pass which is intercepted by huge 6' 6" 276-pound defensive tackle #75 John Meyers and the game is essentially over. The clock runs out and the Eagles have an exciting but tough 21-14 win! You’ll see a vintage L & M cigarette commercial, plus many other players from each team throughout the game including Billy Hunter, Charley Taylor, Don Croftcheck, Bill Quinlan, Paul Krause, John Reger, Bob Pellegrini, Bob Jenks, Chris Hanburger, Jimmy Carr, Sam Huff, Johnny Sample, Joe Rutgens and other Redskins. In action for the home-town Eagles are Sam Baker, Joe Scarpati, Roger Gill, Earl Gros, Jim Skaggs, Ed Blaine, Maxie Baughan, Don Hultz, Dave Lloyd, Tom Woodeshick, Jim Ringo, Al Nelson, Ed Khayat, Nate Ramsey, Bob Brown and more!